Recently, I’ve started reading through my friends’ dissertations (much to their horror, I’m sure). I’m learning so much and am writing up little pieces that interest me. In this episode, I’m looking at my pal Joanna’s work. She interviewed a variety of professionals and asked them how they actually use the prompts of depth and complexity in their jobs. Super interesting! I love this thinking (note my excited note-taking and highlighting)! It supports a layer of the depth and complexity framework that novices often miss: there is a natural movement from prompt to prompt. The highly specific prompts can move towards the more general prompts. And those abstract prompts can also move students thinking towards the more specific. become patterns, which are repeating details. support big ideas, which emerge from details. reveal trends, sudden changes in details. Rather than just asking students to “find the most important details of George Washington’s life,” build on it by asking students to then think about the patterns those details reveal. Or what those details reveal about the big idea of his life. We might investigate the most important details of the various planets, and then ask students to pull out rules about the planets, based on those details. Or ask what students what patterns they see repeating, and when those patterns break. One of my favorite depth moves is to ask students to find the patterns in a situation, and then ask how those patterns have (or might) lead to new rules. But you can also reverse this move: asking students to first look for rules, and then think about how those rules might (or did) create new patterns. Likewise, ethical issues might lead to different perspectives. But multiple perspectives can lead to new ethical issues. 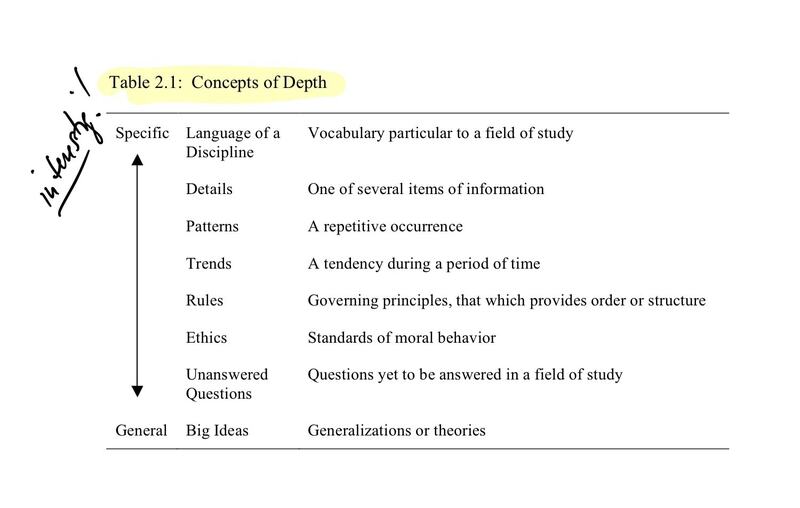 So, as you’re considering which prompts of depth and complexity to incorporate in a task, try to build a sequence. Think about how the prompts can build on each other to take students’ thinking to a deeper level.